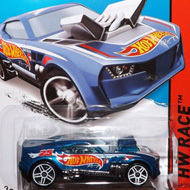 177/250 is part of the HW Race series and the 2014 Treasure Hunt set. 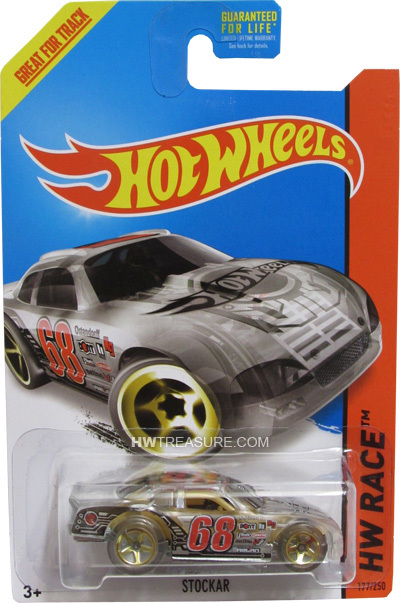 The clear race car boasts black, white & red graphics, a red “68” on the sides and roof, and the Hot Wheels logo on the hood. The sides also have a variety of logos and the low production symbol. It has clear plastic windows, a gold interior, 5-spoke translucent wheels with gold rims, and a chrome Malaysia base. The Stockar made its debut in the 2005 First Editions series. 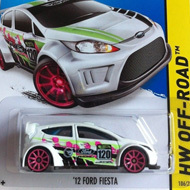 Its body style is based upon the stock cars used in racing.